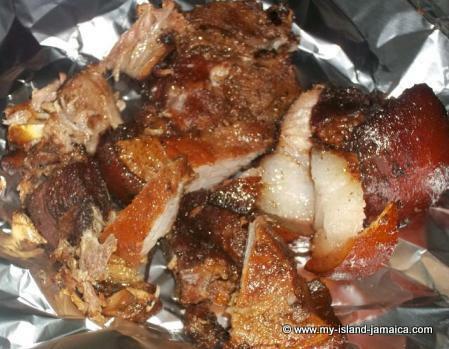 Jamaican Jerk - as it is renowned worldwide, is a style of cooking native to us in which meats (traditionally pork, chicken and fish) are dry-rubbed with a fiery spice mixture called J'can jerk spice. This Jerk seasoning principally relies upon two items: Jamaican Pimento, called allspice, and Scotch bonnet peppers. By the way, never did I know that, when I was picking, drying and selling pimentos as a boy growing up in Westmoreland, I was actually handling the 'secret' ingredient in many highly sought after and world-favorite dishes! Other ingredients include cloves, cinnamon, scallions, nutmeg, thyme, garlic, which is mixed together to form a marinade which is rubbed onto the meat. It is said to be at its best when barbecued over aromatic wood charcoal or briquettes. It is the Pimento (allspice) wood or berries placed over coals that gives jerk its authentic flavor. Jamaican "jerk" ties well into our Caribbean roots, since of all the modern barbecuing processes, in its purest form it corresponds the closest to historical descriptions of the early inhabitants' method. The Arawaks and Caribs, back then, would construct a grid of green sticks some distance above a smoldering green pimento wood (that is, the wood of the allspice tree) fire in a shallow pit, place meat on the grid and cover it with pimento leaves to impart further flavour while trapping the smoke for maximum effect. Originally the jerk meat was cut into strips and dried in the sun for use at a later date. A small fire was lit under the meat so that the smoke would prevent flies from laying their eggs on the raw meat. A grill over an open fire suffices in the modern rendition. The widely available pre-made seasoning mixes give a passable jerk flavour to meat baked in a kitchen oven. Today, the Jerk preparation has evolved from pit fires to old oil barrel halves (drum pan) as the container of choice. It was in the 1960s that Jamaican entrepreneurs sought to recreate the smoked pit flavor, and relatively quickly, came up with the drum pan solution. Oil barrels were cut lengthwise in halves and attach hinges, drilling several ventilation holes for the smoke. These barrels are often heated by layers of charcoal, which some say lends itself to making the burnt smokey taste. 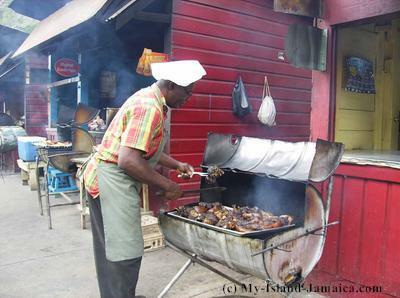 Street-side "jerk stands" are now popular in Jamaica, especially at festivals, parties and similar events. 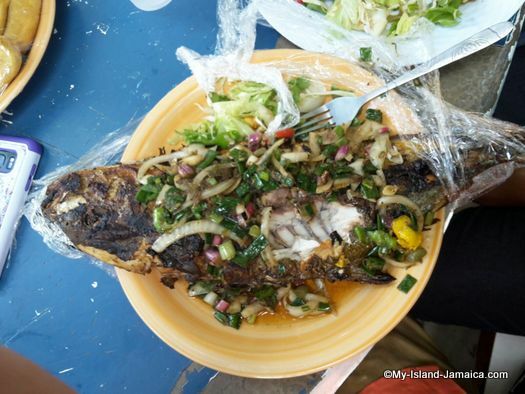 There, the jerked meat, usually chicken or pork, can be purchased along with hard dough bread or Jamaican fried dumpling or 'festivals' served as a side. Recipes for jerk spice vary, and it is often debated around jerk stands about which chef's secret recipe of spices and herbs makes the best jerk seasoning. Jamaican Jerk cooking has followed the Jamaican diaspora all over the world, and authentic jerk can now be found at restaurants anywhere a significant population of Jamaicans exists, such as the United Kingdom, Canada, and the United States. Ready To Try Authentic Jamaican Jerk? Start with this simple and and easy Jamaican jerk marinade. You are also invited to read more about Jamaican food here. We have a 'whole bunch'. 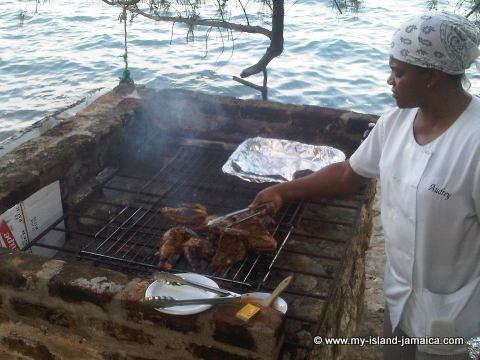 Get our extensive list of free Jamaican recipes right here.